Neyra Gonzalez-Bell was ready to give up not only on her nursing education but her profession as a whole before Grand Canyon University helped her rediscover her passion for helping others. Misha Teague came to GCU intent on maintaining her faith and securing a full-time job. She accomplished both. The two are among 5,789 nursing students who are eligible to graduate this week – shining examples of the types of students the College of Nursing and Health Care Professions has been sending into the world. Already the largest nursing program in Arizona, CONHCP also surpassed Arizona State University in its number of pre-licensure graduates in 2012. GCU had 235 pre-licensure grads take the National Council Licensure Examinations (NCLEX), which are required in order to be licensed by the National Council of State Boards of Nursing. ASU had 218. Grand Canyon students also received high marks again on the NCLEX. After achieving a 95.79 percent pass rate in 2011 – the best marks of any bachelor’s degree program in the state – it did even better with a 97.02 pass rate in 2012. (The University of Arizona, with only 106 pre-licensure grads, had the top percentage in 2012 with 97.17 percent). Teague is one such nurse. 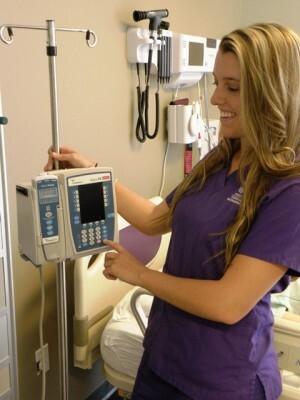 She will graduate Thursday with her bachelor’s degree in nursing and already has a job lined up at Vanderbilt University Medical Center in Nashville, Tenn. Teague will work at VUMC while also studying for her master’s degree after being accepted into the acute surgery tract of its nurse residency program. Teague said she became interested in Vanderbilt because it carries many of the same values as GCU. Teague said she had scholarship offers out of high school and could have attended ASU, but she liked the Christian environment at GCU and smaller class sizes. Gonzalez-Bell had a similar outcome as an online student at GCU. 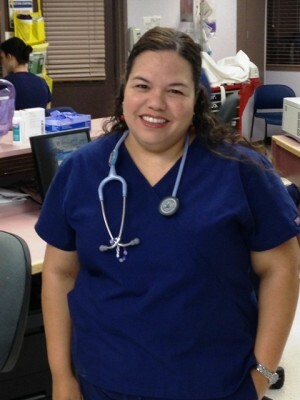 She was working as a nurse at the University of Arizona Health Network in Tucson when she decided to pursue her RN to BSN degree. That was put on hold, however, when she injured her back in 2010 while reaching across a bed to prevent a patient from pulling out her life support tube after she had woken up. The patient ended up being fine, but Gonzalez-Bell said she started feeling pain in her thoracic spine and neck. But after starting classes at GCU, Gonzalez-Bell said her attitude changed. Gonzalez-Bell, 34 and the mother of two, has never been to the GCU campus but is looking forward to her graduation ceremony on Saturday. Contact Bob Romantic at 602.639.7611 or bob.romantic@gcu.edu. This is a wonderful story. It has made me want to chose GCU for nursing! !